Last night I decided to try the bottle of absinthe a friend brought back from British Columbia, and I have to say the real wormwood made all the difference. As I settled into a hazy, hallucinogenic drunk, I had a number of revelations. For one, I realized McDonald’s Filet-O-Fish and apple pie are actually the same item. Two, America’s seemingly insane domestic and foreign policies made perfect sense, and I finally discovered that missing piece of the puzzle that makes all of the others fall into place. It’s the moustache. The moustache once embodied virility. From the cop, to the green grocer to the prize fighter, if you were a real man, you had a hairy upper lip. But, the government doesn’t want real men; it wants pussies because they’re easier to control. Our treacherous leaders know a man and his moustache are a formidable pair, and together they can’t be broken. The government had to find a way to drive a wedge between them, but how? The breakthrough came when the U.S. CIA formed a fictitious band, The Village People, to help associate the moustache with gay culture. They knew if they could convince heterosexual males that moustaches were gay, they wouldn’t grow them, and they could kill millions of moustaches in the womb. Unfortunately for the U.S. government, not everyone would play ball, and that has led to a number of wars. If you look at America’s enemies over the past 10 years, a frightening pattern emerges. 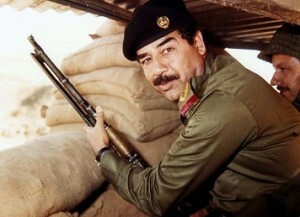 Saddam Hussein – moustache. Mohammed Omar – moustache. Muammar Gadaffi – moustache. Bashar al-Assad – moustache. I have a degree in political science, and I think my moustache metric is the single most accurate way to predict America’s next war. If you’re a world leader with a moustache, ready your troops because our effeminate politicians will soon be coming for you.